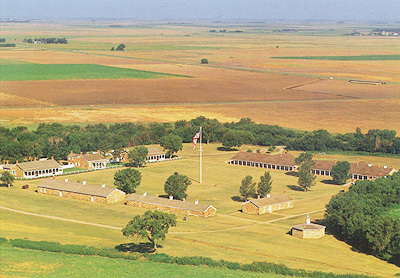 Fort Larned National Historic Site is a finalist for the 8 Wonders of Kansas because it is the best-preserved authentic frontier post in the American West. After the construction of native-stone buildings in 1867-1868, under direction of Captain A. F. Rockwell, Fort Larned was a premier post on the Great Plains. Rockwell's work is legendary, attested by the fact that all buildings constructed at Fort Larned still stand today. Following its active years, the sturdy structures of the post were preserved and used by private owners. The National Park Service acquired the site in 1964. 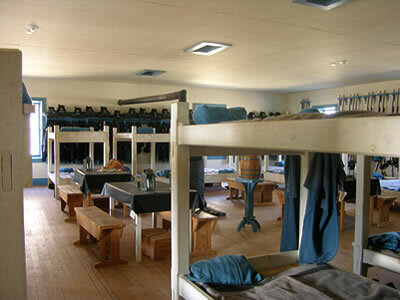 Today Fort Larned National Historic Site has nine original stone structures (including post hospital, bakery, blacksmith shop, enlisted men's barracks, mess hall, officers quarters, and storehouses) and a reconstructed blockhouse. It is situated in a pristine setting on the Pawnee tributary of the Arkansas River. 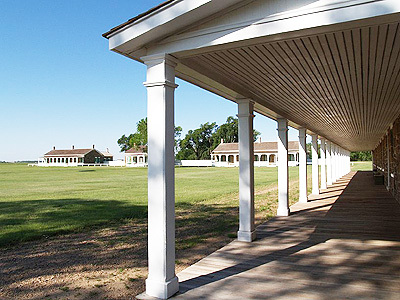 Fort Larned was established in 1859 and was designed to keep the peace on the plains and did so remarkably well through the era of the Civil War and the Plains Indian Wars. Located in an area frequented by many Plains Indians, including Pawnee, Cheyenne, Arapaho, Kiowa, Comanche, and Sioux, military personnel and Indian agents stationed here faced many challenges. The post served as a distribution point for tribal annuities for a few years, leading to an unusual twist of circumstances: the fort that was established to keep Indians from the Santa Fe Trail became a gathering place where large numbers of Indians came to collect their annuities. Many famous officers walked the grounds at Larned as they were passing through including Winfield S. Hancock, George A. Custer, Kit Carson, and Philip Sheridan. Location: 6 miles west of Larned on K-156. Hours and admission charge: Daily 8:30 a.m.-5 p.m.